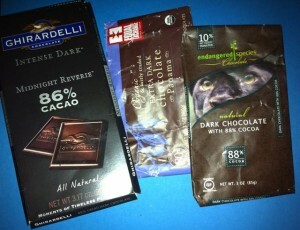 One of the most common “cheats” people sneak into the paleo diet is dark chocolate. When very pure (85% cacao, and ideally no dairy or soy) it’s arguably pretty harmless and may offer antioxidant and other benefits. But with so many choices out there, which is best? Never fear; I’ve accepted the burden of doing some of the sifting and winnowing for you. Thank me later. I think the ideal chocolate bar is 90-95% cacao, with a little sugar, cocoa butter, and maybe a touch of vanilla. No milk solids, soy lecithin, or anything else. Whether you invite nuts to the party is up to you. You might choose to award bonus points for organic, fair trade, domestic, or whatever satisfies your personal proclivities. For this comparison, I’ll be primarily looking at taste and purity. 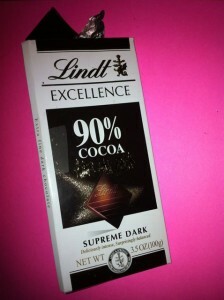 Of the ten bars I tested for this article, my overall favorite is Lindt Excellence 90% Cocoa Supreme Dark. I agree with its “Deliciously intense, Surprisingly balanced” tag line, and I’m quite impressed by the smooth texture and lack of burnt or bitter notes present in even 85% blends from most other brands. Though there is a warning that it may contain traces of peanuts, soy, tree nuts or milk, listed ingredients are only: chocolate, cocoa butter, cocoa powder processed with alkali, sugar, and bourbon vanilla beans. A 40 gram serving has 240 calories, 22 grams of fat, 12 grams of carbohydrate of which 3 grams are sugars. The next tier includes Ghirardelli Intense Dark Midnight Reverie 86% Cacao, Endangered Species 88% Dark Chocolate, and Equal Exchange 80% Extra Dark Panama Chocolate. I would consider these decent “second choices” but not worth seeking out on their own. The first because it contains milk fat and soy lecithin, the second soy lecithin only, and the third because it’s only 80% cacao. The Endangered Species is, however, specifically labeled gluten free (though I suspect most chocolate actually is anyway) and the Equal Exchange is organic. The Panama bar is also made with chocolate liquor and interestingly has a higher (35% in 37 grams) iron content. I’m not sure if it was this ingredient choice or simply slightly higher sugar content that made it the least bitter tasting of the three. The bottom tier (for now– expect this article to be expanded and revised in the future as I force myself to continue taste testing) didn’t quite meet my standards for one reason or another but may be just right for some. Ghirardelli’s Semi-Sweet Premium Baking Bar (as far as I’m concerned any chocolate is “eating” chocolate– ask my wife) is delicious enough, but contains milk fat and soy. I don’t see a cacao percentage listed, but I’m pretty sure it’s south of my 85% target. Similarly, in addition to unnecessary soy the Delish Mid Knight bar from Walgreen’s is a bit too sweet to make the cut at just 70%. I’d like to see them add a soy-free 90% bar to their price-friendly line, to compete with the Lindt offering. 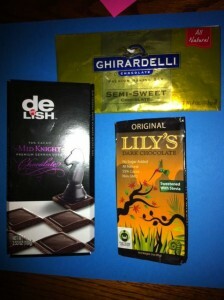 Finally, I really wanted to like Lily’s Dark Chocolate bar, proudly non-GMO and sweetened with stevia instead of sugar. The taste and texture were remarkable, and I’m sure the lack of sugar is a dream come true for certain people. However, I can’t consider it even “paleo-ish” when it includes not only milk fat and soy lecithin, but also inulin (a FODMAP that makes my tummy unhappy), dextrin, erythritol, and unspecified “natural flavors.” If they could work their magic without most of this they might shoot to the top of my list. As I said, everyone’s needs and priorities differ. My opinions are offered only as a guideline. Below is a table that may help you compare other details from the bars I described. Please be aware that manufacturers often make changes, and I make no assurances that this data will be current when you read it. Do your own delicious homework to verify, and please let me know if you discover something special that I missed! Ingredients: Organic Cocoa, Stevia, and Pure Vanilla.. 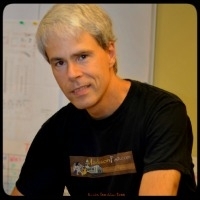 Sounds awesome – looking forward to trying it! Clarification: I’m pointing out the lecithin mainly because it is soy derived, not because lecithin in general causes problems. I feel it’s not necessary for chocolate making and would prefer to avoid it. That said, I sometimes settle for products containing small amounts. 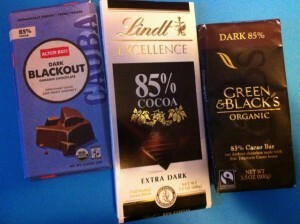 The lindt is about a $1 or $2 cheaper so very impressed with their dark chocolate lineup. 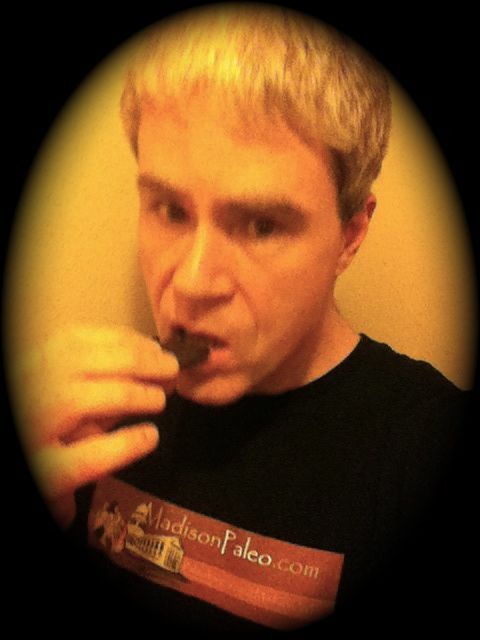 Update: Just had the chance to try Righteously Raw Pure Dark 83% Dark Cacao. Label says vegan, gluten-free, no refined sugar, non-gmo verified, organic. Ingredients: organic cacao butter, organic cacao powder, organic agave, organic coconut oil, organic vanilla. Three 19g servings per bar. Per serving: 120 calories (100 from fat), 11g total fat, 7g saturated fat, 0g trans fat, 5mg cholesterol, 15mg sodium, 5g total carbs, 3g total fiber, 2g sugars, 1g protein, 2% calcium, 8% iron. Made by Earthsource Organics, San Diego, CA. My review: good taste and texture, clean ingredients overall, but I’m not excited about using agave for sweetener, and in fact felt a major energy crash after eating it. Might be a good choice if you do well with agave.